I talked about this project in my recent blog, and thought I’d give a shot at actually trying to blog a build; something that I’m not strong at because I don’t always think to take pictures of things while I’m doing the work, and the pictures REALLY help visualize whatever’s gong on in the shop. As always, comments, suggestions, or witty reparte’ are always welcome. 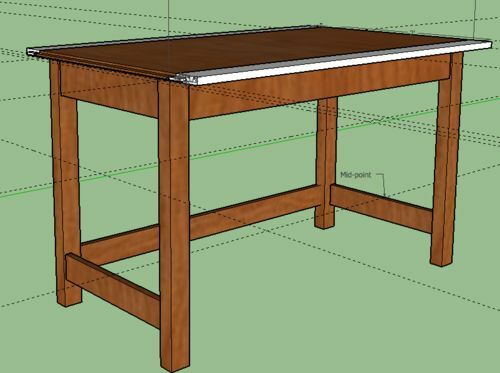 Below is a snapshot of my ongoing sketchup-work-in-progress plans for the mission-style desk. And THIS is a picture from which the desktop is very loosely based on. I have yet to determine the number or dimension of the drawers, but I have plans for structures in case I decide drawers. Prior to this (like about a year ago) the only progress I’d made on the project at all was to glue together the legs. 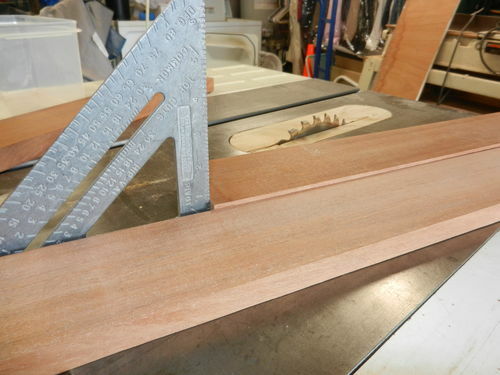 The basic construction of the legs is as follows per leg; rip two boards to dimension minus 1/2 inch (roughly 13 mm) and cut to length + 1/2” (+ 13mm). Glue boards one atop the other. While glue is drying, rip veneer pieces 1/4” thick and the width of the glued boards (in my case, right at 2” (55 mm). 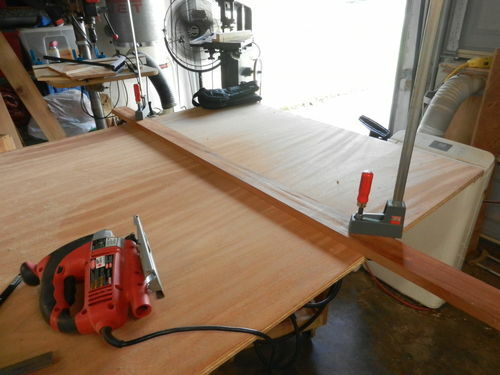 Once the glue is dry, plane the sides of the boards to remove any glue-lines and make parallel. I used a hand-plane during this face as I was just becoming interested in hand-planing. Once smooth and parallel, glue the veneer pieces to the side surfaces. 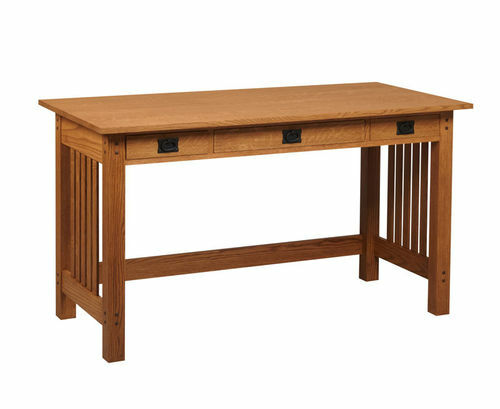 This gives the leg the appearance of having been milled from a single piece of wood. Wish I had taken pictures of the process, but …. 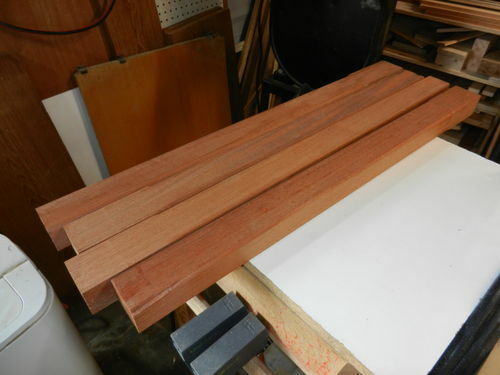 Yesterday I ripped one of the mahogany/sapele boards to width for the breadboard sides and ends. 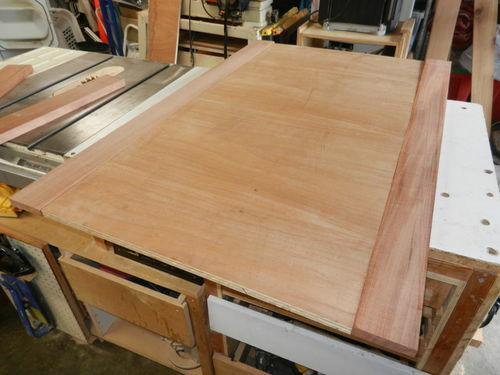 Breadboarding is a nice way to hide the edges of the African mahogany plywood that makes up the core of the desktop. 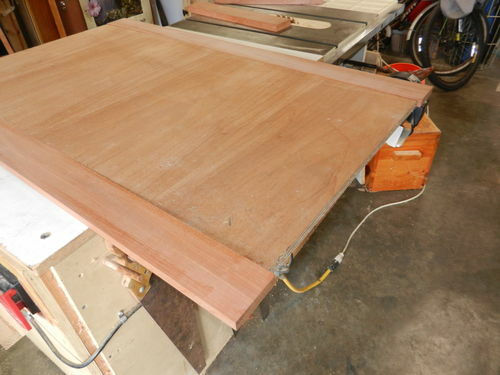 No pictures; it’s ripped boards of mahogany. 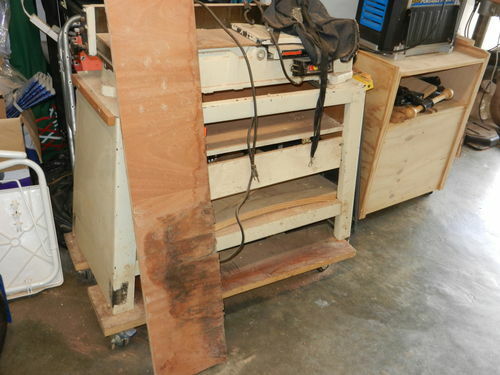 Today I started on cutting the core from the sheet of mahogany plywood. My final dimensions for the core piece are 25 1/4” by 48” (64.1cm x 121.9cm). I added 1 1/2 ” (3.9 cm) because I wanted to use my jig-saw to make the initial cut and gave some waste room because my skills at using my jig saw need a lot of work, then just for practice I clamped a straight-edge across the plywood in case I was actually more accurate than I thought I’d be. As predicted, I need more practice with my jig-saw, as the eventual cutoff piece implies. 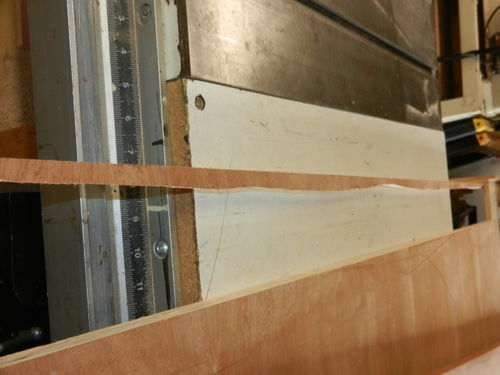 A final measurement of the core, then marked the two side boards and rough-cut to length, then ran the side pieces through my planer to bring their thickness down to match the plywood. In the picture below, the piece in back is the cutoff from the side piece, and shows the original thickness. The piece in front is the side piece and it’s final planed thickness. And then the core and two side pieces placed together to get a feel for how it would look. Sadly, at some point prior to me putting the sheet of plywood on stickers it suffered a bit of water damage on one end that went roughly 10 ” (25 cm) into the sheet. Since I had the sheet down, and less mass to have to deal with, I went ahead and cut the damaged piece from the main sheet. I already have some ideas of things to do with the part that simply has a little water staining vs. the delamination the worst part has.